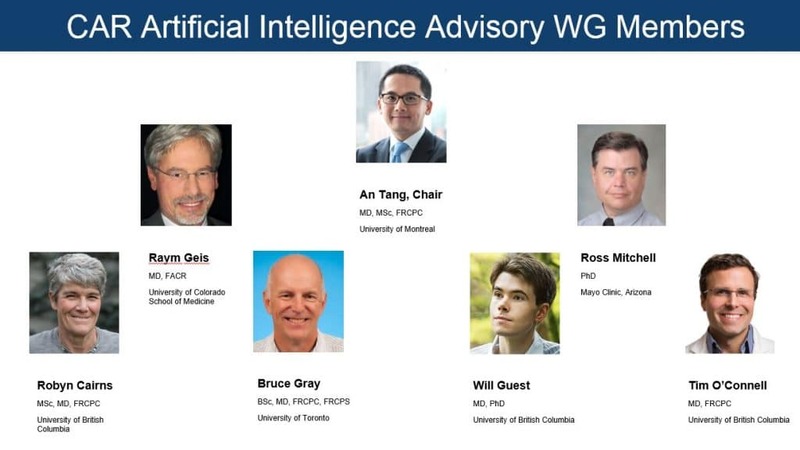 The Artificial Intelligence Working Group was created by the Canadian Association of Radiologists (CAR) with the stated mission to «discuss and deliberate on practice, policy, and patient care issues related to the introduction and implementation of artificial intelligence (AI) mechanisms in imaging». This advisory working group will help ensure that the CAR remains actively involved in the discussions pertaining to the use of AI in imaging in Canada. It is the CAR’s firm belief that radiologists —as the experts in the use of imaging for diagnosis and treatment of disease— should be stakeholders in the development and implementation of data- and AI-driven systems that will be deployed in radiology departments. Established in May 2017, the CAR AI working group includes members from a range of subspecialties (covering adult and pediatric radiology) and backgrounds (including imaging informatics, engineering, biophysics, and research). The working group currently has seven members, including five radiologists, a radiology resident, and a computer scientist. Our working group includes two international members who have been invited to join on the basis of their expertise in informatics. AI is a field evolving at a breakneck pace. Even for radiologists with an interest in this domain, making informed decisions about potential AI applications can be challenging. Therefore, key objectives of this working group are to examine the potential impact of AI; guide the development of CAR policy regarding the use and deployment of AI in radiology; and, through education, help members integrate AI advances into their practices in a manner that is beneficial to our patients and healthcare system. Canadian universities host world-class research laboratories that have introduced AI breakthroughs such as deep learning and reinforcement learning.1 Across the country, strong research institutions, such as the Montreal Institute for Learning Algorithms, the Toronto Vector Institute, and the Alberta Machine Intelligence Institute host leading research scientists and train the next generation of computer scientists. Hence, there is an opportunity for us to promote and facilitate applied research and development of AI applications pertinent to medical imaging. This research would be driven by clinical needs and defined jointly by radiology experts in collaboration with fundamental researchers based in Canada with expertise in AI algorithms. Over the next months, our working group will develop a white paper on AI in radiology to inform CAR members and policymakers. This white paper will help clarify the key issues and best practices pertaining to patient consent, enforcement of confidentiality, data ownership, and potential clinical applications relevant to big data and AI in the context of radiology in Canada. As one of its first activities, the working group has compiled a list of suggested readings and journal articles related to AI, machine learning, and deep learning. This resource was identified as a priority in the CAR member survey on AI. We hope that our brief overview of the CAR AI working group and its mandate will encourage you to attend the 2018 Annual Scientific Meeting, taking place from April 26-29 in Montreal, which will include conferences on the theme of AI. The history of our specialty contains numerous examples of successful adoption of new disruptive technologies. As experts in medical imaging, we are uniquely qualified to lead this initiative, increase our productivity by studying these latest advances, and assert the relevance of our specialty.